One of the last panels of the 2012 Festival of Fear was meant as an homage to literary beasts, spoken of by some of the best writers in the genre today. Monica S. Kuebler once again moderated, this time joined by Kelley Armstrong, Sephera Giron and Greg Lamberson. Welcome to the little corner of our library where we keep all of our favorite reads. It’s here you will find the books that carry the Dreadful Tales stamp of approval – a label we bestow upon some of our favorite dark/horror fiction and non-fiction titles. Now, keep in mind that these are OUR favorites. You may have your own choices and we encourage you to share your favorites with us in the comments. In fact, it’s that kind of action that will get you noticed, and help your fellow genre fiction fiends find the stories that they may come to cherish. In this, the first installment of Dreadfully Approved, we’re going to take a look at those flea-ridden, drooling, violent man-beasts that have plagued fiction for centuries – Werewolves. Centuries, you say!? Yes… centuries. Lycanthropes have been found in literature as far back as the early 1800s, but that’s another discussion for another article altogether. You have to be dead not to dig this book. That’s right. Dead. It still rings true to me. You have to be dead, insane, or have no taste at all to not dig this book. After reading, re-reading, and basically worshipping this novel as one of the best werewolf stories to be offered up in modern genre fiction, I’ve come to the conclusion that there is absolutely no better paced story about werewolves out there. Hell, this one sits high on my list for “best book ever”. I’ve stopped my search for the best of fur themed fiction. This book is my werewolf mecca. 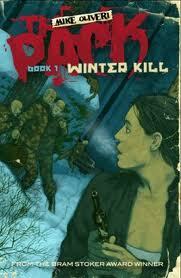 So, in honor of one of my favorite books, I’m re-posting my review of The Pack: Winter Kill from Paperback Horror, with some touch ups and modifications. What you see before you is one of the most incredible mixes of crime, action, and the supernatural that you can ever lay claim to reading. To say that this is the best example of how cross genre writing should be done would be an understatement. Between Greg Lamberson and Mike Oliveri – the bar has been set. When tourists are murdered in a resort town in the Northern mountain range in Minnesota, FBI Special Agent Angela Wallace is called in to investigate. But what she finds tests her training and sanity, for what she discovers should not exist. The above synopsis does not do justice to this book whatsoever. It doesn’t even hint at the intensity that Oliveri has produced throughout this story. Every action sequence and plot point in the story, where we find the characters planning their next move, is coated in massive amounts of tension and suspense. It’s this style that drives the book along, making it something of a quick and exciting read, but also supremely satisfying in the end. The characters in this novel are tight and more or less not people that you can identify with. That being said, I’m going to go further out there and say that they’re more like those that you wish you could be (assuming that everyone has an action filled fantasy or two in their head). Every single one of the characters is written in a larger than life way that is reminiscent of the greatest comic book styles. This was a welcome break, for me, in that they’re not something I had to get too attached to – giving me more time to focus on the masterful storytelling that was taking place. The characters blended into the scenes so well that everything – the whole plot, characters, dialogue and settings – all kind of melded into one another, creating one giant, adventurous, literary version of an excited whoop, that you’ll ever read. It should also be said that The Pack: Winter Kill has crime novel written all over it, but the reader would be mistaken to judge it on that alone. When the book reaches it rollicking crescendo, the author brings out the gore like nobody’s business. Oliveri has an incredible talent for setting up scenes that are not only satisfying, but are also emotionally charged, in that you’re sitting at the edge of your seat waiting for everything to play out. It’s then that he brings out the big guns and gives you exactly what you came for – be it a terrific scene featuring police and procedure, the supernatural eeriness of a winter landscape, or an all-out gorefest at the hands of a terrifyingly powerful werewolf. Whatever your want, I’m pretty sure that this book has you covered. Make sure you check this book out. It is one of the most satifying reads I’ve ever had. You can pick it up at Amazon in Kindle and trade paperback formats. Also, look more news about The Pack and the impending series of graphic novels and prose novels to come, at Mike Oliveri’s website – The Malice Engine. You can also contact him on Twitter and on his message board which is hosted at The Keenedom (registration required). Stay tuned tomorrow for not only a look at the comic book adaptation of the short story – To Fight With Monsters – by Mike Oliveri and Brian Keene, but also a chance to get your hands on one of three copies.